Definition at line 61 of file llfloaterregioninfo.h. Definition at line 91 of file llfloaterregioninfo.h. Definition at line 210 of file llfloaterregioninfo.cpp. Definition at line 168 of file llfloaterregioninfo.cpp. References LLView::addChild(), LLUICtrlFactory::buildPanel(), FALSE, LLRectBase< Type >::getHeight(), LLPanel::getLabel(), LLRectBase< Type >::getWidth(), gUICtrlFactory, LLFLOATER_HEADER_SIZE, mInfoPanels, mTab, NULL, LLTabContainerCommon::TOP, and TRUE. Definition at line 251 of file llfloaterregioninfo.cpp. Referenced by getPanelCovenant(), getPanelEstate(), LLPanelRegionGeneralInfo::onClickManageTelehub(), and LLPanelRegionTerrainInfo::sendUpdate(). Definition at line 74 of file llfloaterregioninfo.h. 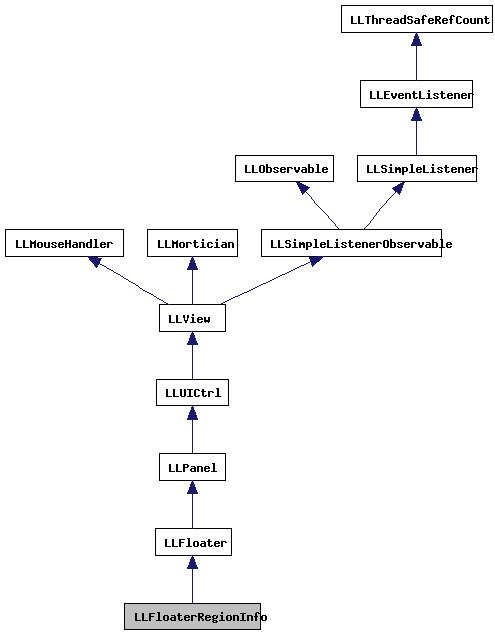 Referenced by LLPanelRegionTerrainInfo::callbackBakeTerrain(), LLPanelRegionDebugInfo::callbackRestart(), LLPanelEstateInfo::commitEstateInfo(), LLPanelEstateInfo::kickUserConfirm(), LLPanelRegionDebugInfo::onClickCancelRestart(), LLPanelRegionTerrainInfo::onClickDownloadRaw(), LLPanelRegionDebugInfo::onClickTopColliders(), LLPanelRegionDebugInfo::onClickTopScripts(), LLPanelRegionTerrainInfo::onClickUploadRaw(), LLPanelRegionGeneralInfo::onKickAllCommit(), LLPanelRegionGeneralInfo::onKickCommit(), LLPanelEstateInfo::onMessageCommit(), LLPanelRegionGeneralInfo::onMessageCommit(), processEstateOwnerRequest(), LLPanelEstateInfo::refreshFromRegion(), LLPanelEstateCovenant::sendChangeCovenantID(), LLPanelEstateInfo::sendEstateAccessDelta(), LLPanelRegionTerrainInfo::sendUpdate(), LLPanelRegionTextureInfo::sendUpdate(), LLPanelRegionDebugInfo::sendUpdate(), and LLPanelRegionGeneralInfo::sendUpdate(). Definition at line 386 of file llfloaterregioninfo.cpp. References getInstance(), LLUICtrlFactory::getPanelByName(), LLUICtrlFactory::getTabContainerByName(), NULL, and tab. Referenced by LLPanelEstateCovenant::confirmChangeCovenantCallback(), LLPanelEstateCovenant::confirmResetCovenantCallback(), LLPanelEstateCovenant::updateCovenantText(), LLPanelEstateCovenant::updateEstateName(), LLPanelEstateCovenant::updateEstateOwnerName(), and LLPanelEstateCovenant::updateLastModified(). Definition at line 375 of file llfloaterregioninfo.cpp. Referenced by LLPanelEstateInfo::accessAddCore3(), LLPanelEstateInfo::accessRemoveCore(), all_estates_text(), LLPanelEstateInfo::callbackCacheName(), LLPanelEstateInfo::isLindenEstate(), LLDispatchSetEstateAccess::operator()(), LLDispatchEstateUpdateInfo::operator()(), LLPanelEstateInfo::refreshFromRegion(), and LLPanelEstateInfo::sendEstateAccessDelta(). Definition at line 75 of file llfloaterregioninfo.h. Referenced by LLPanelEstateInfo::callbackChangeLindenEstate(), and LLPanelEstateInfo::refreshFromRegion(). Definition at line 257 of file llfloaterregioninfo.cpp. References LLDispatcher::dispatch(), estate_dispatch_initialized, getLastInvoice(), LLUICtrlFactory::getPanelByName(), LLUICtrlFactory::getTabContainerByName(), LLPanelEstateInfo::initDispatch(), llendl, llwarns, request(), sInstance, tab, and LLDispatcher::unpackMessage(). Definition at line 290 of file llfloaterregioninfo.cpp. References _PREHASH_RegionInfo, _PREHASH_TerrainLowerLimit, _PREHASH_TerrainRaiseLimit, _PREHASH_WaterHeight, LLViewerRegion::accessToString(), LLViewerRegion::canManageEstate(), LLPanel::childSetEnabled(), LLPanel::childSetValue(), FALSE, gAgent, LLMessageSystem::getBOOL(), LLMessageSystem::getF32(), LLMessageSystem::getF32Fast(), LLUICtrlFactory::getPanelByName(), LLAgent::getRegion(), LLMessageSystem::getString(), LLUICtrlFactory::getTabContainerByName(), LLMessageSystem::getU32(), LLMessageSystem::getU8(), LLAgent::isGodlike(), llendl, llinfos, MAX_STRING, REGION_FLAGS_ALLOW_DAMAGE, REGION_FLAGS_ALLOW_PARCEL_CHANGES, REGION_FLAGS_BLOCK_FLY, REGION_FLAGS_BLOCK_LAND_RESELL, REGION_FLAGS_BLOCK_PARCEL_SEARCH, REGION_FLAGS_BLOCK_TERRAFORM, REGION_FLAGS_RESTRICT_PUSHOBJECT, REGION_FLAGS_SKIP_COLLISIONS, REGION_FLAGS_SKIP_PHYSICS, REGION_FLAGS_SKIP_SCRIPTS, REGION_FLAGS_SUN_FIXED, sInstance, tab, and TRUE. Definition at line 396 of file llfloaterregioninfo.cpp. References llbind2nd(), mInfoPanels, and LLPanelRegionInfo::refreshFromRegion(). Definition at line 245 of file llfloaterregioninfo.cpp. References gAgent, LLAgent::getRegion(), and show(). Definition at line 216 of file llfloaterregioninfo.cpp. References LLMessageSystem::addUUID(), gAgent, LLAgent::getID(), LLFloaterView::getNewFloaterPosition(), LLControlGroup::getRect(), LLAgent::getSessionID(), gFloaterView, gMessageSystem, gSavedSettings, left, LLFloaterRegionInfo(), LLMessageSystem::newMessage(), LLMessageSystem::nextBlock(), LLFloater::open(), processEstateOwnerRequest(), refreshFromRegion(), S32, LLAgent::sendReliableMessage(), LLMessageSystem::setHandlerFunc(), sInstance, top, and LLRectBase< Type >::translate(). Referenced by LLShowFloater::handleEvent(), and show(). Definition at line 92 of file llfloaterregioninfo.h. Referenced by LLFloaterRegionInfo(), and refreshFromRegion(). Definition at line 90 of file llfloaterregioninfo.h. Definition at line 87 of file llfloaterregioninfo.h. Referenced by getInstance(), processEstateOwnerRequest(), processRegionInfo(), show(), and ~LLFloaterRegionInfo(). Definition at line 94 of file llfloaterregioninfo.h. Referenced by getLastInvoice(), and nextInvoice().